Highland is in an extended partnership with Ridgewood Baptist Church in southwest Jefferson County in order to enhance and support their progressive voice of faith to this part of our city. Ridgewood Baptist Church began in the 1960’s and has always been a moderate, progressive Baptist congregation. They are affiliated with the Cooperative Baptist Fellowship and American Baptist Churches, U.S.A. Following the resignation of their pastor in 2007, Ridgewood struggled with declining attendance, limited resources, and an unclear direction for the future. Conversations with Highland began in early 2008 and resulted in a plan to partner together to strengthen Ridgewood. A task force, with three members from each church, was formed to give oversight to this effort. The plan included moving Ridgewood’s worship service to 1:00 p.m. on Sundays in order to allow HBC to provide worship leadership. Joe Phelps and Nina Maples began as co-pastors of Ridgewood in September 2008, and Steven Schafer served as the first full-time pastor of Ridgewood from June 2010 through July 2013 since the Highland-Ridgewood partnership began. Rev. Matt Johnson began his tenure as Pastor of Ridgewood in October 2013 and continues there today. Ridgewood has enjoyed steady growth since the Highland-Ridgewood partnership began.Under excellent leadership of Matt Johnson (Pastor) and Fred Bogert (Minister of Music), the congregation is stepping boldly into their role as southwest Louisville’s progressive voice of faith. 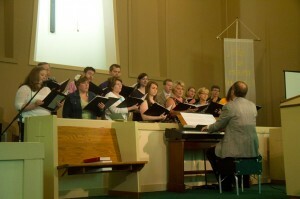 In 2012, Ridgewood celebrated 50 years of faithful ministry in Southwest Louisville. For more information about Ridgewood Baptist Church, visit their website, Facebook Page or contact Matt Johnson.